Quinoa is gluten free and a great source of protein. It tastes delicious with these chilli prawns and basil pesto. Place the prawns in a bowl with the garlic, shallot, red chilli and olive oil. Stir well, cover with cling film and marinate for 10 minutes. Meanwhile, bring a large pan of salted water to the boil. Pour the quinoa into the pan and cook for 10 to 12 minutes or as per the packet instructions. Drain the quinoa well and place it in a bowl. Pour in the pesto, then mix well with a fork and set aside. Heat a large sauté pan over a high heat and add the marinated prawns. Sauté for 3 minutes, stirring regularly. Season with salt and pepper and a squeeze of lemon juice. 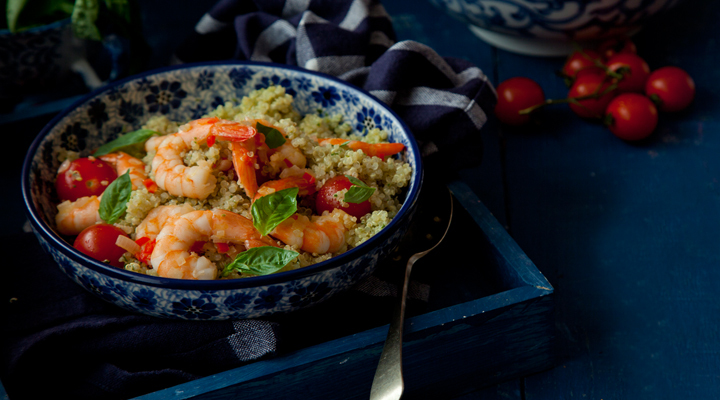 Divide the quinoa betwen four dishes and top with the warm prawns, a few fresh basil leaves and cherry tomatoes.